Owning your own business means you are the boss. The boss of your business, the boss of your time, in short, the boss of it all. That said, are you also the leader? For the last six months, Monday Morning Motivators has been on sabbatical. As an email newsletter that started in 1999, the leader/boss of the news needed a sabbatical, me. Over the life of this newsletters, I’ve had over a dozen different writers, eight different methods of delivery and the world continues to change. Starting with the next issue of Monday Morning Motivators, we will be using a new delivery service – still email, different service. I started as the Leader of a new method of getting information to business owners, but over time, became the boss of a weekly newsletter that needed content and different voices. What started out as fun and full of excitement turned into a “gotten do the newsletter” which lead to less fun for all involved and less excitement to the end reader. This newsletter went from being just an email to learning different platforms, staying ahead of spammers and still providing fresh content weekly. Also, over the last 8 years, the blog became a method to help other writers get their information out in a less formal method and with social media assistance, the possibility of more outreach channels is now mind-boggling. Learning is key in my life and the next adventure is on the horizon. More on that soon. Leadership has been a favorite study area for me the last six months, and much has been written about it, believe me a lot! I work at a library and know of the shelves and shelves of books on leadership. 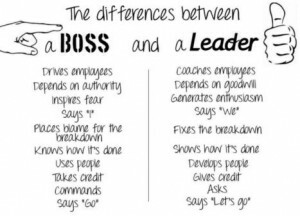 The graphic included in this letter shows the negative term of “boss” but what I’ve observed is that we often use the word “boss” to refer to our manager or direct supervisor with no negative meaning. Leader is often reserved or revered for the few. 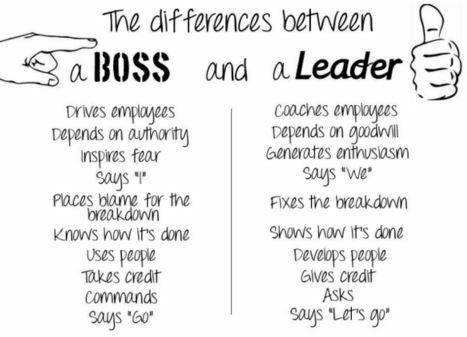 Observe the leaders and bosses in your life. Remember, even a child can be your boss – think infant. A good boss knows the job and knows what she wants to get it done. Sometimes that is what is needed. A leader will be the inspiration to change, challenges and may not even know who you are but still lead you to greater good. Have a great week and let me know how you faced the world of leadership this week. cousin. I’m not certain whether this put up is written by him as nobody else understand such specific about my problem.